Norwegian Jewel is 92.000 tonnes and carries 2376 passengers and 1154 crew giving a good crew to passenger ratio. The Braemar was docked behind her and she was certainly dwarfed by Jewel. You can tell on first sight that she is not a traditional cruise ship but very modern. Personally I find all the bright paintwork on the hull and along the walls of ‘prom deck’ a bit distasteful, but I got used to them as the weekend went on. We arrived around 1.00pm for our 3.00pm embarkation and the departure lounge was pretty quiet when we had checked in. We were shocked to find that the bar only had half a bottle of gin and a bottle of whiskey. The sandwiches had all been purchased from Marks & sparks and they were running out of milk. We bought Mr C the last two bottles of Bud and Jeannie & Amanda also had beer, but shock horror YM had to settle for a diet coke – shock horror! Amanda saved the day though when she produced a bottle of warm champagne from her suitcase. Not long afterwards we were called to board the ship early – Hooray! We had an inside cabin of deck 4. I loved the carpets in the corridors – bright blue sea colour with tropical fishes! Our cabin was about the same size as a standard P&O one, with highly polished cherry wood panelling and fittings. Plenty of shelf space, hanging space and a compact corner dressing table. The hairdryer was half decent and we had tea/coffee making facilities and fridge. Bathroom was longer with a proper shower screen instead of curtains and again panelled with the cherry wood. We never seen our cabin stewards from start to finish, but they were extremely efficient whoever they were. Amanda was chuffed because she had a ‘proper’ porthole – a round window not a square window! We set off to explore and find a drink and none of us could stop ‘Wowing’!! Our biggest Wow’s were for the Garden Villa’s – absolutely amazing!! I have seen some of the best suites afloat but this one topped them all. The dressing room was bigger than our cabin. The bathroom was huge and both the shower and bath looked out to sea. There was a flat screen TV over the bath just incase you got board with the view! A grand bedroom with chaise lounge and rich satin covers with a glass wall, again looking out to sea. In addition to this there were two smaller bedrooms. Oh I forgot about the grand lobby as you entered the suite – yep you hold a dance in there on the lovely marbled floor! Anyway, step outside the bedroom and you’re in your own courtyard – wow! Hot tub under a little thatched roof, a dining area, lots of plants and wicker sofa’s. from here you could go up some stairs to a private deck with about 8 wicker padded loungers and 2 of those lovely huge double bed sofa type loungey on things. Back downstairs across the courtyard we entered the lounge area. Not what you would expect in a ‘suite’ This one was very trendy, flat screen TV, laptop, cream leather modern round sofa, a bar with several barstools and a dining table. One day I’ll have a suite like this hopefully and enjoy every moment of it. The ship also has several Courtyard Villas, which again had separate lounge and 2 bedroom areas but these were considerably smaller. Passengers in the courtyard villas also had access to a shared courtyard again with hot tub and plunge pool and access to their own private sun deck above. Very nice. We had enough of exploring and decided it was time for food. We ended up in Sky High bar overlooking the pool are and also served food – one of the 10 restaurants onboard. I think the menu changed daily but me and jeannie had some very nice chicken and fries while the Mr C and Amanda went for burgers. Very fast service and nicely presented. This was the start of our Cocktail tasting session and very nice they were too. $5.50 normally but if you wanted a souvenier glass they were $8 – we soon found out that regardless of whether you wanted a souvenier glass or not you got one with every order. They were very good at ‘selling up’ without you realising it! I came home with a carrier bag of matching glasses! Muster drill was compulsory and a roll cal was taken at the muster station so there was no getting away from it. We decided to do sailaway from the Jacuzzi as it was such a lovely day. Of course more cocktails flowed. And a very lively ‘caravan’ type band played on deck with passengers dancing around the deck. We turned into squealing kids again when we realised we were being escorted out of dock with a water cannon boat. A fantastic sight in the sunshine. Pre dinner drinks took us to Spinnakers – the room with a view but different to a ‘Crows Nest’ This was the nightclub venue. Very trendy furniture – funky shaped orange sofas, Big Brother cream leather ‘donout’ chairs, and these amazingly comfy crushed velvet, bright blue, double bed, double ended lie on chairs. They were so cool and so comfy! You just kicked off your shoes and climbed on while they served you drinks watching the best sunset I have seen in years – Amazing! We opted to eat in the Tsars Palace. You can pre book any of the dining venues via phone or at reception but we chose to just wing it and had no problem getting a nice table for 4. All around the ships are flat screen displays showing the availability of each restaurant, cover charge and how likely you to have to wait. 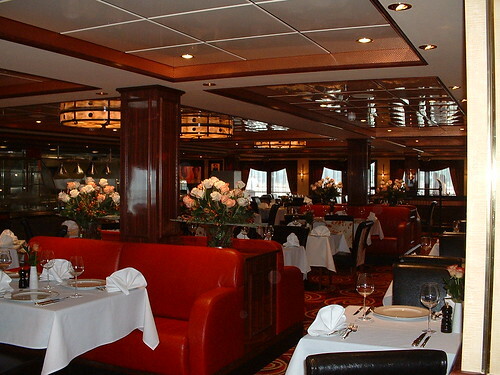 This was one of the main restaurants at the aft of the ship with huge windows looking out to sea. Very opulent, rich colour scheme, gold stair case, crystal chandeliers, Faberge eggs decorating the place etc. The service was superb and none of us could fault it. The waiters all introduce themselves and we had a lot of them serving us. They checked that every single thing was ok. Everytime we ate a maitre de came and checked everything was ok. Someone was watching all the time to check that we had enough butter, had the bread rolls ran out, did we need the pepper, recommendations were made, wine was topped up with every other mouthful – absolutely superb! None of the staff seemed stressed or under any pressure to perform. By now it was gone 11 o’clock and it had been a long day so we checked out the ‘Galleria’ of shops before turning in for the night. I know that Spinnakers went on to around 6.00 am with the band playing 70’s and 80’s til the early hours. We awoke the next day and we were in Amsterdam! First we went to Garden Café for breakfast. A very well designed and laid out self service restaurant that runs from the midships to the aft. Loads of different serving areas serving everything you could imagine. I sat down to discover I hadn’t got a spoon for my cereal – not to worry a waiter had spotted my puzzled look and was off in search of a spoon, next question ‘can I get you anything else? Tea? Coffee? Juice??. Tables were cleared so fast. A dirty plate of cup was never left and tables were always available. Food was served in here 24/7 and the selection was superb everytime we walked through. They were serving a full roast in the evening and as the setting was so nice I might have elected to dine in here on a longer cruise. Beyond the Garden Café was an open seating area over looking the stern and another condensed version of the Café serving area. There was also a bar area and it would be a very nice area to sit for sailaway amongst the garden. So Amsterdam – We were offered very little in the way of how to get into town or indeed which way it was. No shuttle buses were provided. Eventually a taxi turned up which we grabbed and shared with Jeannie & Amanda to get us to town. The girls were going to Ann Franks House so we were dropped there. Im sure they will tell you all about Ann Franks place. The taxi was 16 euros into town and 10 euros out. We opted for a walk around the town and along the canals etc. Mr C was very shocked to see a ‘lady’ with her boobies out sitting in her ‘living room’ window. He hadn’t realised they were everywhere and thought they had their own special part of town where they were confined to! But the ship was calling me, as they always do, so we were soon in a taxi back. We needed a drink so decided to go to the civilised Maltings Beer & Whiskey bar where obviously they specialised in whiskeys and draught beer. Next I fancied a champagne so naturally I wanted to get it from the Champagne Bar!! Fab bar area with bubbling glasses and bottles set into the bar and wall behind the bar. Poor Mr C nearly fell of his bar stool when he got the bill $36 dollars for 2 glasses of Verve Clique – eeek! Next it had to be feeding time and opted for the Blue Lagoon where the serve fast food and wok fried dishes. Again the service was very good and it was washed down with yet more cocktail. It seemed in a weird sort of place overlooking the atrium with a a man playing a grand white piano but very relaxing all the same. So now we needed to chill out a bit (stressful being on a cruise) so we went to the Bora Bora Health Spa. 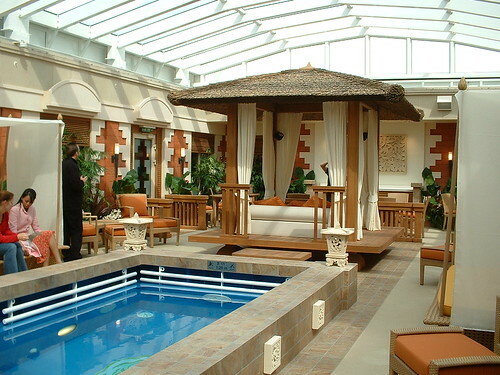 We used the hydropool overlooking the front of the ship and then relaxed on the stone heated chairs. Sadly the Jacuzzi, plunge pool, sauna and steem room was all segregated into his and hers sections within the changing area so we couldn’t use those together. Had no choice but to return to the outside deck and make use of the 5 jacuzzis out there. With a few cocktails of course!! We chose to watch our sailaway form Amsterdam from the comfort of Spinnakers at the top of the ship. 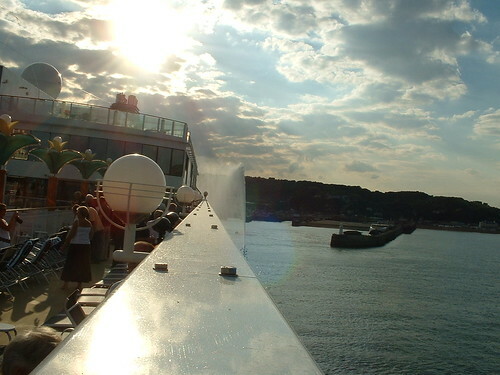 Again we were escorted out by a fireboat/watercanon – a fantastic sight in the bright evening sunshine. We all sat with our noses pressed against the window as we watched all the amazed drivers driving along the canal side, stop and stare at this huge brightly painted liner just sailing past! Next we moved onto the Cocktail Bar for a Cosmo’ and a few more pre diner drinks. We sat in the wiondow and watched as we passed through the lock into the north sea – what an experience! We hadn’t booked anywhere for dinner but fancied Mamas Kitchen the Italian Restaurant but it was still full at 10 in the evening so we made our way to the Azur Resaurant, the second of the main dining rooms where we were seated immediately. This restaurant was very different from the other main restaurant but equally as nice. The Azur is much more contempory and modern. Service again was first class and the maitre de passed by a few times for a chat. Our stewardess was lovely and wouldn’t let us be without anything. The service was first class and they are all so smiley and friendly. All of the fodd we ate on this cruise was 110% delicious and cooked to perfection. As Amanda mentioned we had a bit of drama when the pilot boat came bobbing alongside our window and made quite a few dramatic attempts to come alongside as she bobbed up and down in the swell. As we had entered the dining room very late again it was also very late when we had finished dining and left the restaurant, but it was nice to feel so relaxed and chilled out. We all decided we had had a fantastic time but it was time to turn in as we had long drives the next day. Me & Mr C did take the long treck up to Spinnakers to see what was happening and this huge room was packed, not a seat in sight and everyone was up a bopping to the band – would have love to have stayed but I was far too tired. Disembarkation the next morning was ‘Freestyle’ just leave when you’re ready, no hassle, no people queueing everywhere. Wish P&O could do that! In the usual place at the front of the ship, two decks high, very good sight lines with little to obstruct the view. We didn’t go to any of the shows so couldn’t comment. Huge area with all the usual tables and slots etc. Very jazzy place in bright yellows and reds. I loved this place as it was such a good idea. There was no cabaret in there during our trip and it was used for karaoke all the time it was open. It had a funky nightclub feel to it and a large screen for the karaoke etc. It was a well used are in the evenings. But the best bit was it had 3 annexe rooms, Red, Green & Blue Room. I think they held about 20 people and they had your own karaoke system in there so could be used for private parties etc. You could also lock the door and drawer the curtains so I dread to think what people could have got up to in there. We spoke to ‘Teddy Man’ who said they had used it and said the had a ball in there. It would have been a great fun place for a crowd of WLC’rs. A room of 16 leather high back chairs purely for smoking pipes and cigars. Very Gentlemans Club. In the bottom of the Atrium serving speciality coffees and scrummy cakes. Bright pink and bold stipy colour chairs and icy stalagtights coming down from the ceiling. Served asian cuisine and waiters and waitresses were all dressed accordingly in kimono type things which added to the atmosphere. Don’t think there was a cover charge. Looked a bit like eating in a stainless steel kitchen to me but a friend tried it and she said it was great fun. Again no cover charge. Samll restaurant overlooking the atrium and out to sea. No cover charge. Again no cover charge, very popular and a more informal atmosphere. We never made it around the prom deck but Im pretty sure it is not wrap around. As I mentioned it has art work along all the walls which I suppose made it quite interesting. No teak deck though just the rubber flooring which looked slightly odd to me. This was a blast of colour and certainly took your breath away the first time you saw it. It was surrounded by palm tree pillars which light up at night. There were tow sea water pools. 5 jacuzzis, two with shelters over them. A circular band stand. Lots of tables and chairs but all sunloungers were on the deck above overlooking pool area. Oh and there was one of those kids swirly slide watershoot things that you see at aqua parks. Mr C and Amanda could harly contain their excitement and scurried off like two excited kids to climb to the top! Up another two decks were basketball courts etc. Amanda also found a giant oversized shower which I suppose was just a fun place to go and cool off. NCL have a steward going around all the decks to mist you with cooling water as you sunbathe and they place an iced flannel on the back of your neck too! How cool is that? Very large gym with all the upto date equipment that looked like hard work. Two well equipped rooms to cater for the two age ranges of kids. Own splash pool and Jacuzzi. Also had their own cinema with bean bag seating. We had a couple of little niggles and really they are only minor but never the less griped us slightly. One is the automatic gratuities. 15% is added to every bar bill which we found a bit much and bumped up the price of a drink. So in a way we were penalised for drinking premium drinks yet you could say you get a better deal if he only brings you a coke. Plus the drinks looked soooo expensive in dollars and we couldn’t really work out what we were spending. The other thing was automatic tipping added to your onboard account. This was $10 per person per day which would soon mount up for two or a family over a two week period. I would much rather it was added to the cost of my cruise along with the drinks service charge. That way Ive paid it and its accounted for and I can budget for the rest of my cruise. There was no literature to state that the gratuity could be altered in any way so Im sure most passengers just pay up, but I did go to reception and ask the question ‘could I increase or decrease the amount taken from my onboard account?’ There was no hesitation and no argument just a polite ‘yes mam of course’ I didn’t change anything but it was reassuring to know I could if I wanted to on a longer cruise I could. As mentioned throughout we could not fault the service from any crew member onboard the Jewel. Each and everyone gave service with a smile and it was always fast and efficient. Any crew member that passed on deck would greet you regardless of rank etc. The announcements and multi announcements in varying nationalities started to annoy me, probably made worse as there was a speaker directly outside our cabin which we found intrusive. Im sorry but I still don’t like cruising with multi nationalities, but that’s a personal thing. NCL also attrats a lot of Americans and it is very widely sold across Europe. The entertainment created a great atmosphere onboard and there was always plenty going on of different degrees. Apparently a cdouple christened the lifeboats on the last night. We were speaking to two travel agents who had an obscured view cabin overlooking the lifeboats. When they returned to their cabin in the early hours they noticed two figures walk past there window along the crew walkway. The did the business in the lifeboat and then the girl hoisted herself back in her dress and they left the same way as they came! Security was hot on their heels but they weren’t fast enough!! Overall we had a great time. I loved the ship and might be tempted to try in one day, maybe in the Caribbean. The lead in prices are usually very good with NCL but once you add on all the extra charges etc its probably the same as P&O prices. I still prefer to dress more formal in the evening but it was ok to dress more casually for a couple of days. Most made the effort but some didn’t and so that would grate me a little. It also seemed a bit strange not having a set routine of dining etc but I could get used to it and you would definitely need to be a bit more organised and get your preferred dining option booked to avoid disappointment. Would I recommend NCL – Yes I would! I have cruised the Bahamas with them and had a brilliant time. To say this was a shakedown cruise and had never been to sea with passengers before I was amazed. There were none of the hiccups or horror stories that you hear happen on maiden voyages. This is one of the areas P&O could take a few tips from because nothing ever seems to run 100% for them. The mix of bars, Eating venues and entertainment ensured that there was something for everyone. Once again thanks to Jeannie and Amanda for some great company, and of course Mr C who put up with us all! We all know we were extremely lucky to be given the opportunity to try out such a lovely brand new ship but cant wait to do it again! Im now considering a career of testing out new ships and writing reviews! Hope you are still all awake as I know I have a tendency to ramble!! Im sure I will think of lots more I haven’t mention but I’ll keep you posted.